Now you can Change your Name, Religion and date of birth by online. The Printing and Stationery Department is under the Administrative Control of the Industries, Energy and Labour Department of Government of Maharashtra. Just follow the below steps to Change your Name, Religion and Date of Birth. Step 1 : Go to the official website of Directorate of Government Printing & Stationary provided above. Step 4 : Select any one mode from below given options to create user name and password i.e. User ID and Password by verifying UID or Create own user profile using OTP verification on your mobile number. Step 5 : Please fill below mention information to create User Name and Password through detail profile using OTP verification on your mobile number. Fill Aaple Sarkar Registration form in 6 steps i.e. 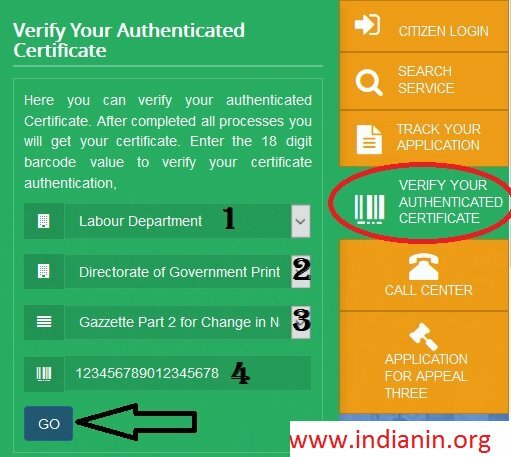 Step 6 : After login with User Name & Password, on left side user can see Department names like Agriculture, Home Department, Industries Energy and Labour Department. Step 7 : Click of Industries, Energy and Labour Department User can see Sub Department. Select Directorate of Govt. Printing & Stationery for Service of Name Change/ Religion/ DOB. Step 9 : Read instructions carefully, Download form, take its print out, fill up the form with proper details, now scan this form which will be used further as attached documents. Step 10 : Click on Next tab to view Online application form. Select proper option for Caste Category OPEN /BACKWARD in Online application form. Step 11 : If user is Minor, (below 18 age), click on Is Minor check box and Enter the correct information required. Step 12 : Click on “I Accept” Checkbox and Proceed button to continue. Step 13 : Attach required documents & click to Upload Document for online payment. Step 14 : Payment Details are displayed with Amount. Click on “Proceed for Payment” Option Receipt will be Generated after Payment. After complete your Application you can check your Application Status by following below steps. Step 2 : Click on the Track Application Status link in the right side of the page. After completed all processes you will get your certificate. Enter the 18 digit bar code value to verify your certificate authentication.